There was only one Isaiah, Jeremiah, Ezekiel, Elijah. Elisha, Daniel, Zechariah, Malachi, Amos, Micah but that doesn’t mean you’re not prophetic. To be prophetic does not mean you can speak for God on things like the future, call down fire from heaven, although those just listed could. 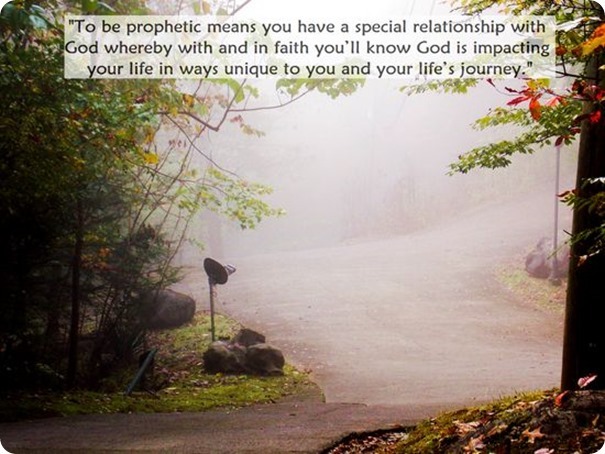 To be prophetic means you have a special relationship with God whereby with and in faith you’ll know God is impacting your life in ways unique to you and your life’s journey. At the risk of taking a verse from Zechariah out of context please don’t be one of these people he prophesied about. “On that day people will be ashamed to claim the prophetic gift…” (Zechariah 13:4, NLT) Instead claim the prophetic gift because “God HAS GIVEN us His Spirit!” There is no MAYBE about it “God has given YOU HIS Spirit!” The person who recognizes and acknowledges God’s gift of the Holy Spirit IF they believe they will find themselves saying, “I’m not going to think the same way I used to because I KNOW God’s blessings WILL BE forth coming.” Believe! Anticipate! Experience! Be transformed!